WxL(in) 8” Casters Cat. No.’s Wgt. Durable 12 gauge steel shelves with extra under bracing, 3/16" thick angle corners, and 12 gauge caster mounts for long lasting use. 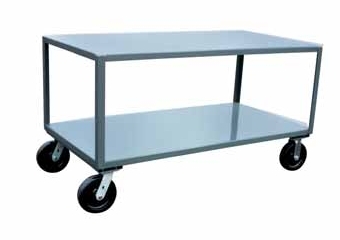 Bolt on casters, 2 swivel & 2 rigid, for easy replacement and superior cart tracking — 8" Phenolic casters.